Two posts in less than 24 hours… you should feel very privileged. Anyway, while browsing the internet during lunch at work today, I happened to stumble upon what is supposedly a leaked image of the ball that will supposedly be used as the official match ball for World Cup 2014 in Brazil. 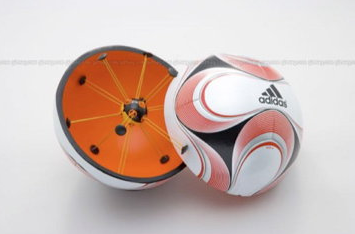 is this funkylooking contraption the official ball of the next world cup? i don't know. So first things first, let’s cement the fact that I have absolutely no clue if this is legit or not. It’s very possible this could be an artistic rendering, a hypothetical prototype, or a wonderfully done bit of trolling from the underbelly of the internet. Discovered in a Facebook group entitled “WOW!! THIS IS WHAT THE 2014 WORLD CUP BALL LOOKS LIKE! !”, which if you’re like me, definitely threw up a red flag or nine. Either way, I figured it would be worth posting just for joy of speculation. In my highly un-qualified professional opinion, it looks like some odd combination of K’nex building toys and the Russian satellite Sputnik. What purpose do those little internal arms serve? Maybe the ball doesn’t require any sort of inflation, or maybe it’s some futuristic solution to the whole goal line technology dilemma. What would it feel like to kick that thing? I think could totally shatter the plastic pieces with a good kick, right? Secondly, would adidas really go with that similar of an external design to the last two World Cup balls? Maybe I’m nitpicking a bit, but it’s a case that could be made. adidas and FIFA will charge three arms and a leg for it. Please, please, please comment and let me know if you have any more information on what’s pictured above, and i’ll be sure to give you due credit with the “breaking” news. More pictures, technical reports… someone’s got be able to debunk this thing in a heartbeat. Update: How quickly things can be debunked. Reddit user “JimmySinner” pointed out that this was a prototype ball developed a few years back. Further investigation has revealed that it was used in the 2007 FIFA Club World Cup, and went by the name of “adidas Teamgeist II”. Here’s some video of the technology, which was supposed to be able to assist with goal line technology. No word on how effective the technology was, though I would imagine it will never see the light of day again so long as Blatter is alive. My apologies for my very amateur reporting. Previous Post: rolfe’s still got it! That ball was released in 2007 and is not the world cup ball. It is the Teimgeist II and it is a preview for the goal line technology ball. Hey Eyal: if you caught the edit at the end of the article, updated literally hours after I originally posted this back in 2011, I made note of the same thing. But thanks for the comment and be sure to check back! The arms are high speed aluminum and are implemented with a GPS used to aid refs for things like penalties and stats on players when connected wirelessly to a computer.